“De Immigrant” is the towering icon of this town, which is sometimes known as “The City on the Narrows” because it claims to be at one of the narrowest points on the wide Mississippi. 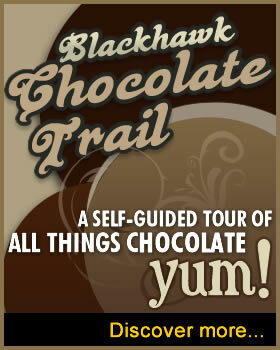 We stroll the streets of this “Dutch city” that is an effortless drive of about an hour from the Quad-Cities. It’s Dutch-Dutch everywhere because tulips — looking mostly petal-like — are stenciled on the downtown sidewalks. You can’t miss the windmill, the most dominating thing on the riverfront, at 1st Street and 10th Avenue. It is 90 feet high, which makes it about the height of a nine-story building. On the way to the mill, we admired a giant metal Dutchman with big wooden shoes who was fishing. He looks like a Dutch-capped Paul Bunyan. Just across the street from the Dutchman, we took a long look at the remarkable half-tree in someone’s yard. Every inch of its tall trunk is decorated with wooden cutouts. It’s not corny; it’s a curiosity. Then, straight ahead was the windmill. The clouds had broken and the sunset was gushing through the windmill’s sails in reds, oranges and golds. It was the hour of the day when we were face-to-face with the Netherlands. 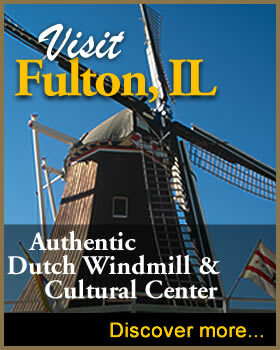 There are few more perfect places for a windmill than Fulton, which was settled by immigrants from Holland. Some of them settled first in Michigan and then relocated to Fulton because it reminded them of their European homeland. It took far more than a century, though, for the city’s residents to get their authentic Dutch windmill. You’ll be fascinated to hear the whoosh of the sails, and it takes little to imagine you are in the Netherlands, not just 45 miles north of the Quad-Cities. This is a working mill, and if wind conditions are suitable, it will mill wheat, rye, buckwheat or corn. Stone-ground flour is for sale at the mill and the Fulton Meat Market. “De Immigrant” is perched upon a berm, surrounded by grassy lawns, geraniums and lavender. We smiled at an ocher-colored cat chasing a black-and-white cat across the lawns. They acted as though it was their personal turf. Inside the mill is a gift shop with mill-ground flour, Netherlands memorabilia and artwork, and Dutch candies for sale. Warning: You’ll be tempted. This mill is nothing touristy. Stroll around through its sturdy wooden framing. You’re welcome most everywhere, even though it takes some climbing and is partially handicapped-accessible. The windmill was designed, manufactured and partially assembled in the Netherlands. Then it was disassembled and getting it to Fulton became a major project. It arrived by ship, rail and truck. Everything but air! Dutchmen stick together. A pair of craftsmen from the Netherlands came to Fulton to reassemble the mill. For all intents and purposes, they became residents. It took them 10 months to do the job. This was a project to be done right. The millwrights were joined by two Dutch masons to clean and install the bricks for the mill. Fulton’s Welcome Center, which is in the mill, used bricks salvaged from a 125-year-old building in the Netherlands. Bricks around the base of the mill are from a 150-year-old building in the Netherlands. I looked about and sensed that everything around the place is authentically old. A 25-ton cap sits atop the mill’s octagon base, which contains the sails, the shaft for the sails, the brake wheel and the brake. Follow me? If not, visit the mill and look around. As the wind moves the sails — an awesome sight — the brake wheel rotates other shafts and gears. It sounds complicated, and it is, but everything is so authentic. 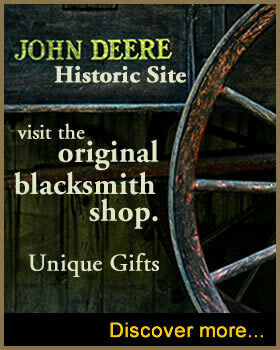 You’ll find few places in America that hew to the old-time methods used in Fulton’s mill. Sheep fat — and only sheep fat — lubricates the wooden beams on which the cap turns. Beeswax — again, only beeswax — lubricates the brake wheel cogs. 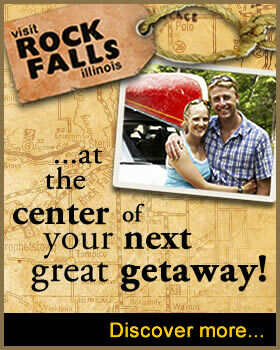 The mill is a relative newcomer when it comes to Quad-City region attractions. It was dedicated in 2000, and one year later, blue basalt grinding stones — quarried in Germany — were added to grind authentic wind-driven flour. Efforts to make the mill, a city operation, a major tourist attraction are never-ending. The city is receiving a $150,000 grant from the State of Illinois to build a museum nearby. It will house 22 scale-model windmills. Some are small, but two of them are more than 6 feet high. When finished, the museum will have cost about $422,000. It’s hoped-for completion is by next summer. One of the unseen favors of Fulton’s Dutch windmill is its admission price. It’s free! Donations, though, are gratefully appreciated. June through August, the hours are 10 a.m. to 5 p.m. Monday-Saturday; 1-5 p.m. Sunday. September hours are 10 a.m. to 3 p.m. Monday-Friday; 10 a.m. to 5 p.m. Saturday; 1-5 p.m. Sunday. May and October hours are weekends only: 10 a.m. to 5 p.m. Saturday; 1-5 p.m. Sunday. Other times are by special arrangement only. Reprinted by permission from the Quad-City Times, Davenport, iowa.